NBC hasn't officially announced anything yet, but the latest issue of TV Guide names the new 16-member crew for next year's Celebrity Apprentice 2. 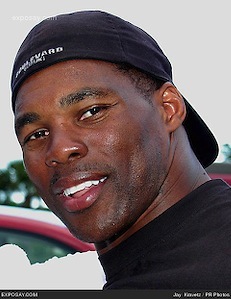 Among those spotted during taping of the show in New York were former Dallas Maverick Dennis Rodman and ex-Dallas Cowboys running back Herschel Walker. Hmm. Walker revealed that he suffers from multiple personality disorder in his recently published autobiography. 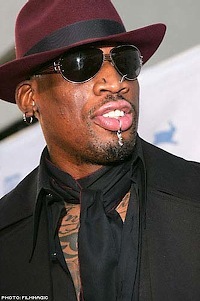 And Rodman already is infamous for displaying numerous personalities both on-and off-court. So maybe they'll get along famously. Rodman and Walker reportedly will mix and match with the likes of Melissa and Joan Rivers, Andrew Dice Clay, Tom Green, Clint Black and Scott Hamilton. Wow, the star power is overwhelming. Oddly enough, there's also an almost overpowering odor of of has-been B.O. ***ABC's Ashton Kutcher-produced Opportunity Knocks has joined Fox's Do Not Disturb in the fall season's cancellation corral. In their short previous lives, both were exciting new series. At the other end of the teeter-totter, CBS has picked up its new The Mentalist for a full season. ***The Republican ticket at least is doing very well on broadcast network comedy shows. VP nominee Sarah Palin's guest appearance on NBC's Oct. 18th Saturday Night Live propelled the show to its highest Nielsen numbers since March 12, 1994, according to invariably accurate "overnight" measurements from 56 TV markets (including Dallas-Fort Worth). That 1994 show was hosted by U.S. Winter Olympian Nancy Kerrigan, with Aretha Franklin as the musical guest. Also last week, John McCain's make-good appearance Thursday on Late Show with David Letterman propelled the CBS program to its best rating since Dec. 1, 2005, when Michael Richards apologized for racial remarks made at a Hollywood comedy club. McCain also helped Letterman score a rare win over Jay Leno's Tonight Show, which welcomed Democratic vp nominee Joe Biden. Letterman's 6.5 million viewers swamped Leno's 4.8 million.